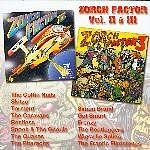 Two rare and classic Psychobilly compilation LP`s on one CD! Tracklisting: TORMENT-Hornet`s Nest / SKITZO-Psycho Baby / FRENZY-Robot Riot / GET SMART-Swamp Fever / THE BOOTLEGGERS-Chicken Woman / CARAVANS-I Ain`t Got No Excuses / TORMENT-True Expressions / SKITZO-Tear It Up / WIGSVILLE SPLIFFS-Home Run / GET SMART-Ready Or Not / THE BOOTLEGGERS-I`m Comin` / CARAVANS-Alcohol Eyes / COFFIN NAILS-House On The Haunted Hill / SKITZO-Crying State / TORMENT-Route 66 / CARAVANS-I Heard It Through The Grapevine / RESTLESS-Ghost Town / SPOOK & THE GHOULS-Reaper Grim / QUAKES-I Can`t Stay / PHARAOHS-Crazy And Wild / SIMON BRAND-Broken Home / GET SMART-What`s Your Papa Gonna Say? / CARAVANS-That`s The Way It Is / SPOOK & THE GHOULS-Live And Raw / SURFIN` WOMBATZ-I Hear The Pounding Of My Heart / FRANTIC FLINTSTONES-Safe Surf.